For me SCS rushed some parts of France, espacially big cities. Hello, is there still no new developer for France? Too bad..
That's a really awesome landscape at this area. It would be interesting to have this expressway from Italy to France at Promods.. In real, this expresswayalready exists in France and is very well represented. Just missing Monaco. Just seen it. But already not driven there. Mhm. Time to get a tour from Italy to France.. Here, possible connection if you build Monaco. Toll's etc a bit simplified at the moment. There is 2 possible access, an easy access to do is by la Turbie, the developer will only have to build Monaco behind. Unfortunately, this access is forbidden to the truck. After the hard access is to build the A500 highway and the tunnel. More hard because you need to made a connection with the A500 and the A8, so he need to rebuild that part of the A8 and the toll. But honestly, it's largely possible to do it and it will be wonderful to do Monaco. Yes, SCS simplified the A8 off ramps into 1 single. Easiest, but not most realistic, would be to connect A500 to Monaco to the roundabout currently ingame. The 2011 truck route can be seen in my signature. But since then, they have made a new tunnel. And I think a new way to get to the delivery point"s". Sadly I have not seen any newer dash cam's from that area. I would like to see a dash cam from 2018/2019. With the new route. Viewing distance etc might pose a big problem, atleast on the A500 between the tunnels. And that there would be only 1 realistic delivery point, or 2, very close to each other. I will take a look at France (so I am more or less the successor of Kutchek ), to be exact on eastern France: Alsace. The reason why it moved me to start in this area is the current situation there ... pretty empty here; furthermore the A35 is really strange to me indeed. 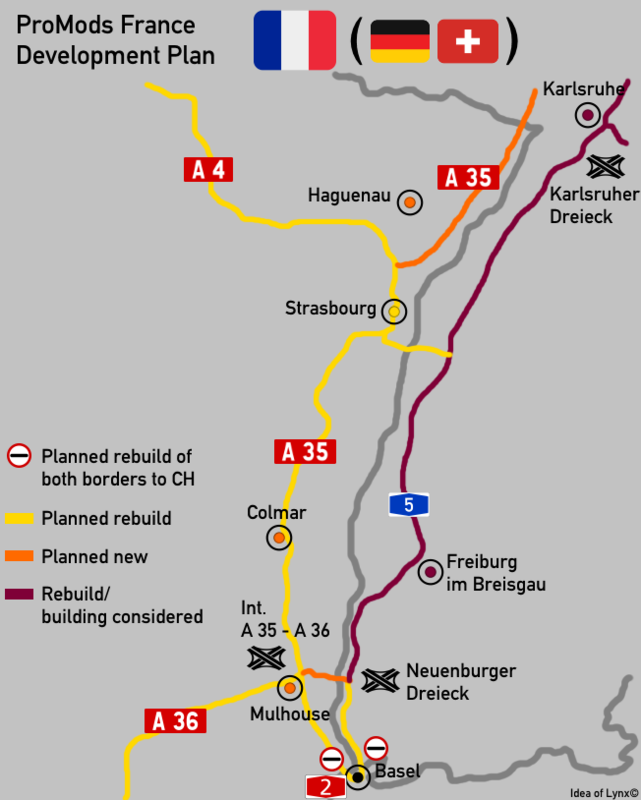 The first step for me is adding the interchange A 35/A 36 near Mulhouse and to rebuild the border crossings to Switzerland (including the road to them of course). I will probably help out and improve/add some areas in Germany as well but this is limited to Baden-Württemberg for now as eastern France is my main focus.